Marble tiles, thresholds, and window sill s are becoming increasingly affordable thanks to the direct import and distribution service provided by Stonexchange. We are a natural stone importer located in Miami, Florida, and we provide top-quality material to construction companies, flooring product retailers, and home improvement centers. One of our most popular marble styles is Nuevo White Carrara, a beautiful white-and-gray stone taken from quarries in the Mediterranean region. White marble has long been the stone material of choice for exterior walls and columns. It looks equally impressive when shaped as a window sill or transition saddle. White Carrara tiles have a brilliant shine and will become the highlight of any interior, whether placed as a floor surface or countertop. Obtaining these lustrous natural stone products has never been easier, nor has the price ever been more appealing. Our company operates on a bulk-purchase principle, meaning that our commercial customers save on larger orders of natural stone. The wholesale select white marble offered by Stonexchange comes from the same geological origin as many of the attractive tile products seen on the Nalboor online showcase. We invite interested parties to take a closer look at our import and distribution plan as well as our wide selection of Nuevo White Carrara. There are a number of lighter marble shades, each with its own generic label. Some contractors are familiar with Alabama or Georgia marble, and others have gotten used to the Cherokee or Vermont tag. These marble shades are white or off-white and contain gray streaks as well as a small amount of spotting. Nuevo White Carrara is the perfect replacement for any of the above-mentioned names that may be specified on the building order. However, it is important not to confuse a truly white/gray marble with other light shades such as Bianco, Crema, or Vanilla. These names designate a slightly darker, creamier shade with entirely different vein patterning. White Carrara looks its best when given a high-quality polish. It is usually cut into square tiles, rectangular sills with smoothed edges, or floor thresholds with one or two bevels. Stonexchange offers the finest quality White Carrara at truly wholesale prices, and our select material is shipped directly to our distribution center in Miami. We deliver bulk orders throughout the southern part of Florida, and we can arrange a single or recurring shipment to any commercial address. Our premium White Carrara is affordable because we own and/or operate the manufacturing centers where the material is cut and shaped. This means that our commercial clients do not pay an inflated price that includes a broker or reseller fee. Instead, they deal directly with the manufacturer and distributor, and the per-piece cost is indeed wholesale. The Nalboor Tiles website focuses on flooring tiles made from premium quality marble, travertine, or limestone. However, Stonexchange is more than just natural stone tiles. In addition to floor tiles, we carry a large selection of saddles, window wills, soap caddy cut-outs, and shower curbs. Our Nuevo White Carrara marble is one of the most popular lines of stone products, and we maintain a huge inventory in our Miami-based distribution center. Depending on the actual building instructions and the wishes of the eventual property owner, marble styles required for the project at hand may not be finalized or agreed upon until well after construction or remodeling has begun. It is therefore imperative that the contractor or installer have a connection to the most affordable marble product at all times of the year. Stonexchange guarantees not only the quality of our natural stone products, we also guarantee availability of all standard sizes and shapes of our sills, countertop stones, floor tiles, and floor thresholds. Most interior designers construct an interior draft with an eye toward primary and secondary accents. The walls, drapes, furniture, doors, and window frames make up the majority of what a person will see upon entering the room. However, the secondary accent shades – such as window sills, floor thresholds, and bathroom tiles – must not only complement the primary color shades, they must also perfectly match each other. White marble is a shade favored by designers because it blends well with both medium and dark primary accents. It is also very stately in appearance, giving the room interior a classic, tasteful look. Of course, marble is also very functional, acting as a natural air conditioning unit and saving the owner money on energy bills. Stonexchange carries all of the most commonly requested sizes of window sills, thresholds, and shower curbs. We also deliver these products directly to the customer, even to construction sites throughout the Miami area. Some of our customers are flooring product retailers, and these merchants appreciate the cost savings that we offer. An independent contractor wins a bid for the installation of 200 windowsills at a hotel undergoing renovation. He or she needs to stay under budget by purchasing materials not to exceed a certain per-piece cost. The first place the contractor visits is a retail flooring company that orders product from its parent corporation. The contractor is not given a reasonable quote because the order is unusually large and will take time to process. The parent company buys from a broker who doubles as an importer of specialty construction products. The bottom line is this: the contractor cannot afford to spend the amount stated on the quote, nor can he or she wait six months for the product to arrive at the job site. The merchant will never see that contractor again. However, there is good news for Miami-area flooring companies and home improvement centers wishing to attract more commercial traffic. Stonexchange offers top-quality tiles on our Nalboor website, and we also sell the lowest-priced thresholds, window sills, and countertop blocks to be found anywhere. These products are available 365 days a year, and we deliver to our clients in one or two business days after the quote has been given. 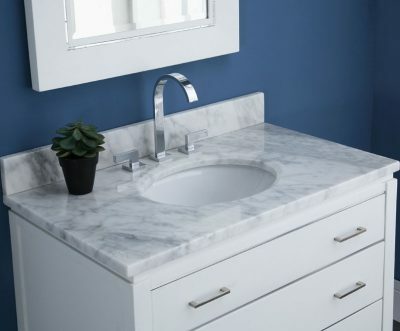 The merchant who deals directly with a manufacturer/importer enjoys not only the lowest wholesale prices on select White Carrara marble, he or she also obtains product whenever it is needed to fill inventory or complete a customer order. Stonexchange maintains a very large inventory of marble because we constantly bring full-sized containers across the Atlantic from the manufacturing sites located in Europe. Stonexchange carries a full line of Nuevo White Carrara marble window sills and floor thresholds. These products are expertly crafted and shaped, packed into containers for transatlantic shipment, and arrive at our distribution center ready for delivery to commercial clients. Our customers save money on these bulk orders because we promise truly wholesale prices on deliveries that meet or exceed our minimum piece requirement. Our window sills are available in the standard 37-inch, 56-inch, and 74-inch lengths. The sill thickness is 5/8-inch and the widths vary from 3-18 inches. Minimum piece count ranges from 50-100 pieces depending on the length and width ordered. Our floor thresholds are available in standard double bevel as well as single or double Hollywood bevel style. The thresholds are shaped with advanced cutting equipment and are given a high-quality polish prior to shipment from the manufacturing center. The standard length of our floor saddles is 36 inches, and we also take orders for custom sized, non-standard lengths and widths. The floor tiles shown on the Nalboor Tiles product pages can be ordered alongside the Nuevo White Carrara marble products we carry. Our company does not charge extra for orders containing multiple products, nor do we add any surcharge for recurring orders. Our customers save money on freight charges as well. We choose reliable overland freight companies and have an ongoing contract with some of the most dependable couriers in the Miami area. Ordering product from Nalboor Tiles or directly from Stonexchange is a simple process. Our customer service staff is quite knowledgeable and can answer any questions put to them concerning product styles, color compatibility, and minimum order requirements. Clients can also rest easy knowing that we take the extra step to ensure safe delivery of our materials. A small breakage allowance is figured in to the final price quote, but we are happy to report minimal damage on most shipments. We carefully perform a quality assurance procedure on all orders prior to loading and shipment. We place full-crate orders on pallets or in large containers that are loaded with the appropriate packing materials. Our shipments can easily be unloaded at the destination with the aid of a lift truck. Don’t be fooled by the terms wholesale and discount. These words can be used by anyone and everyone, and usually are. However, we at Stonexchange offer a truly unique method of acquiring the finest quality natural stone products at a substantial cost savings. To find out more about our Nuevo White Carrara marble or other stone materials, check out our product pages and view the Nalboor Tiles online showcase. For detailed information on how to become a dealer for our products or to obtain a price quote, contact us and speak with a service representative. Remember, top-quality White Carrara marble is expensive, but we can take a huge chunk out of the price you might expect to pay. White marble from Italy with slim grey veins.